Pumpkin Gutter - Page 9 - Zombie Pumpkins! Reviews of specific carving products by those who've used them. I finally ordered one of these tonight off Amazon. I honestly don't mind gutting pumpkins, but each year my hands seem to hurt more and more when I start scraping. I am really hoping this will help with thinning the walls which is what I have the most problem doing. I will make sure and watch the instructional video first. I LOVE my pumpkin gutter! Never leave home without it! I wanted to pass along a suggestion to any of you that own or work at a pumpkin patch this time of year. One of our customers is offering pumpkin gutting to his customers for a couple dollars per pumpkin. He has made over $1000 with each of his 2 Gutters already! Just a clever idea that I wanted to share. Happy Halloween and Happy Gutting! I used this for the first time this year. It took me a couple of tries to get the hang of it, and it's a lot easier if you have someone to hold your pumpkin while you gut it. I mainly used it for thinning and while I can't say it went a LOT faster, it was definitely easier. RavensDestiny wrote: I used this for the first time this year. It took me a couple of tries to get the hang of it, and it's a lot easier if you have someone to hold your pumpkin while you gut it. I mainly used it for thinning and while I can't say it went a LOT faster, it was definitely easier. do your hands atleast hurt less? Yes! That was the best part about it! Less hand hurting = more carving! got mine last year and tried it a couple times it was kinda awkward at first, I wasn't convinced, but this year I really got the hang of using it, and WOW it is all they say! I think I may get one. I am thinking of having a Pumpkin Carving Party next year and it would be nice for my guest to have a fastly gutted pumpkin. I love my pumpkin gutter it's a total time and hand saver!! And I love being able to thin the walls of my 'kins so easily, making for better carves. 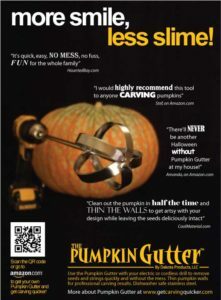 Hello Pumpkin Gutters! I just wanted to chime in on a question that was posed on another forum regarding Pumpkin Gutter 2.0. We did make a slight change to the design several years ago and any product sold since has been the new version. The way to tell if you have the new version is to look for a slight twist in the blades at the bottom of the Gutter. This change was made so the Gutter more easily removes strings from the bottom of the pumpkin. Hope this helps and Happy Gutting!